Kevin Pietersen made 16 in his first innings since being discarded by England as his Delhi Daredevils were beaten in the Indian Premier League. The Delhi skipper, 33, saw his side fall four runs short of the 184-1 target set by Sunrisers Hyderabad. Pietersen, who had not batted since the final Ashes Test on 5 January, scored only one run in his first eight balls. And, after hitting Darren Sammy for six, his 17-ball knock was ended when Dale Steyn had him caught at long off. 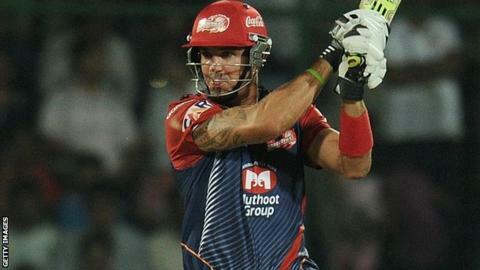 Pietersen, who missed Delhi's first three games through injury, said: "The hand is good as gold. It proved that in the wicket because I shouldn't have hit it that far. "It's nice to play cricket again and it's brilliant playing in front of all of these fans." The Daredevils have won only one of their first four games and lie seventh in the lucrative eight-team Twenty20 competition, which finishes on 1 June. Pietersen was axed by England following the Ashes whitewash, with England and Wales Cricket Board managing director Paul Downton saying last week that there is no chance the Surrey batsman will be recalled following the appointment of Peter Moores as coach. As well as appearing for Surrey and Delhi, Pietersen will play for St Lucia Zouks in the Caribbean Premier League.